The recognized plasma components of the anticoagulant system include antithrombin (AT), protein C (PC), and protein S (PS). PC is a circulating vitamin K-dependent zymogen that is activated to activated protein C (APC), the active enzyme, by the thrombin-thrombomodulin complex. Thrombomodulin is an integral membrane protein on the luminal surface of endothelial cells that binds thrombin and changes the thrombin activity such that thrombin no longer clots fibrinogen or activates platelets. Instead, thrombomodulin-bound thrombin activates PC to APC. APC functions as an anticoagulant by inactivating (via enzymatic cleavage) F5a and F8a in the presence of PS (Figure 12-7). 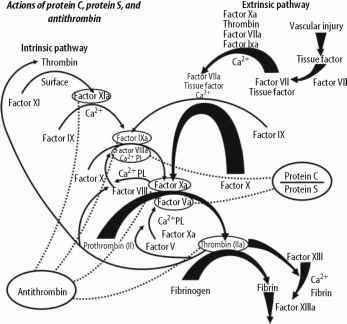 Procoagulants F5a and F8a are cofactors that, together, markedly accelerate the rate of thrombin generation. Thus, F5a and F8a are key hemosta-sis regulatory points; inactivation of these cofactors markedly downregulates thrombin generation. Antithrom-bin is a serine protease inhibitor (SERPIN) and acts as a pseudo-substrate for thrombin to irreversibly inhibit thrombin and procoagulants F9a, F10a, F11a, and F12a by covalently binding the enzymatic active sites. Antithrombin anticoagulant activity is markedly enhanced (catalyzed) by glycosaminoglycans (e.g., heparin). deficiency to family members with no defect, the lifetime VTE risk is increased 7- to 8-fold. Individuals with homozygous PC or PS deficiency may develop severe full-thickness dermal and limb thrombotic infarction as neonates (e.g., purpura fulminans neonatalis). 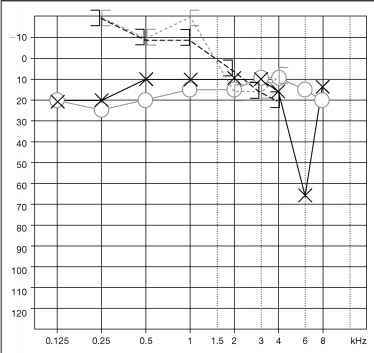 Homozygous AT deficiency appears to be incompatible with life except for mutations that impair heparin binding to antithrombin. Altogether, deficiency of AT, PC, or PS is found in approximately 5% of VTE patients. Mutations causing impaired expression or function of AT, PC, or PS are rare and distributed throughout their respective genes. Moreover, there is minimal data correlating specific mutations with a unique clinical thrombosis phenotype. Thus, functional testing of plasma activities of AT, PC, or PS is preferred over genetic testing for diagnosis. Factor V Leiden is a founder mutation, arising between 21,000 and 34,000 years ago, after the evolutionary divergence of Africans from non-Africans and of Caucasoid from Mongoloid subpopulations. Worldwide, the Factor V Leiden carrier frequency ranges from 2% in southern Europe to 15% in southern Sweden, and generally declines in native populations moving from west to east toward Asia, Africa, Australasia, and ultimately, the Americas. In the United States, about 3% to 7% of asymptomatic white populations of northern European or Scandinavian ancestry are heterozygous carriers. Factor V Leiden is much less common in other U.S. populations, with a carrier frequency of 1.2% in African Americans, 2.2% in Hispanics, 1.2% in Native Americans, and 0.45% in Asian Americans.